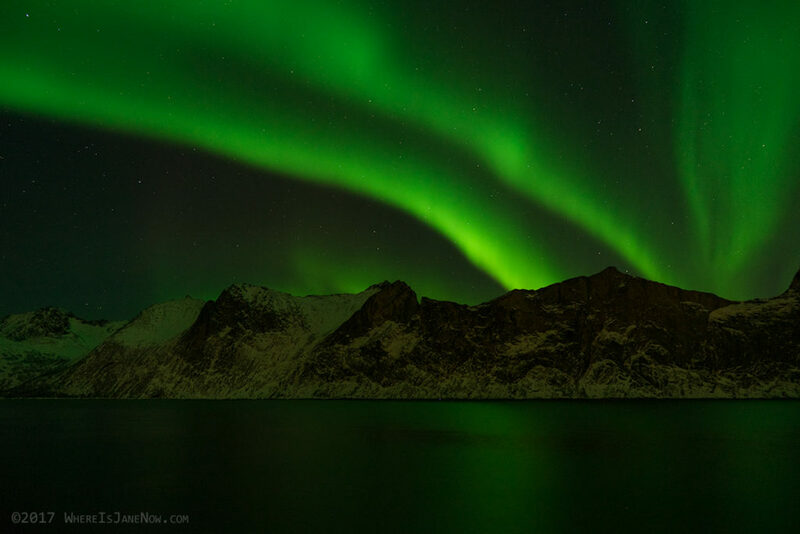 Two days on Senja for Northern Lights Photography – Where is Jane Now?! Red and green aurora behind the trees. 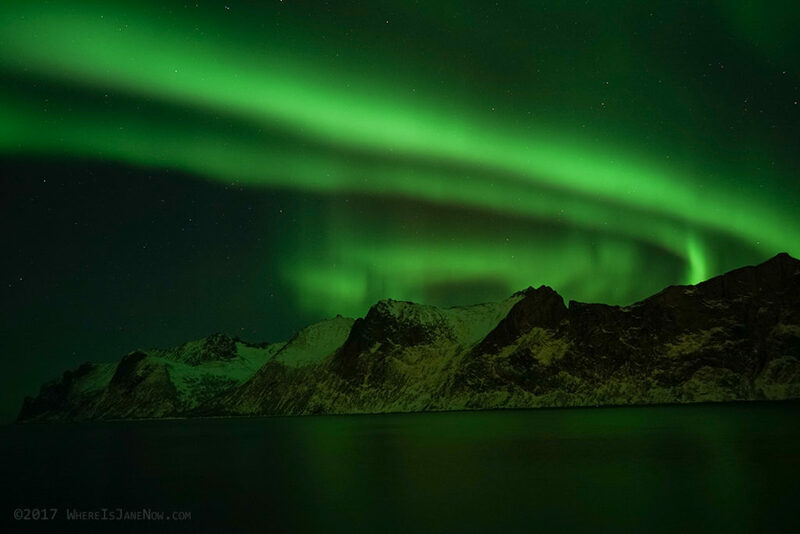 Inland on Senja, more subtle but so beautiful! These were definitely subtle to the naked eye, but the camera captured them quite well! I waited 4 hours for these to come out... hung out in a convenience store and cleaned and organized my car, chatted with folks at home who were just waking up... basically was quite bored for a while, but worth it! 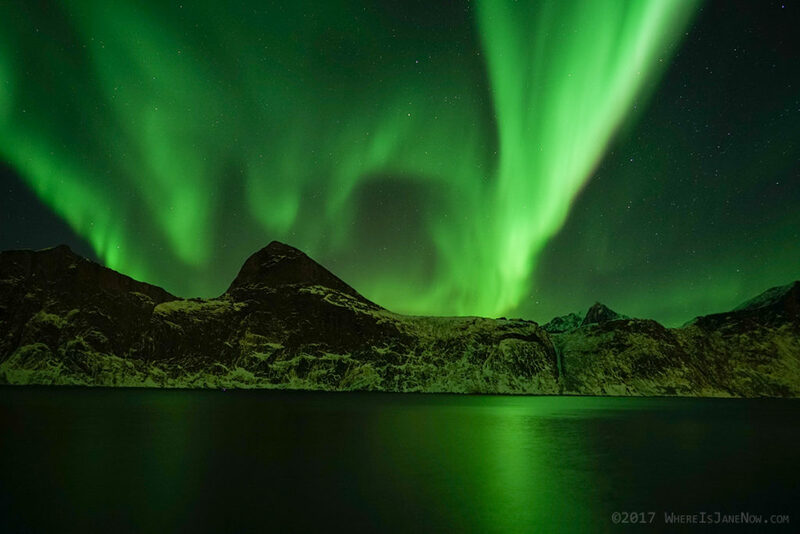 I started my trip to Norway with very little planned, knowing that I would need to travel around to find places with no cloud cover for Northern Lights photography. 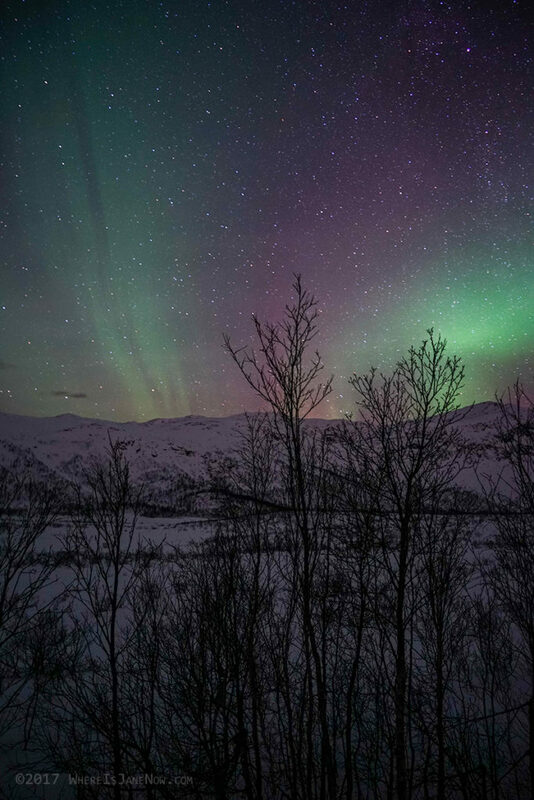 One adventure was over to Senja, which is less than 3 hours south and west of Tromsø. I booked an AirBnB in Finnsnes so I would not have to drive all the way home late at night. 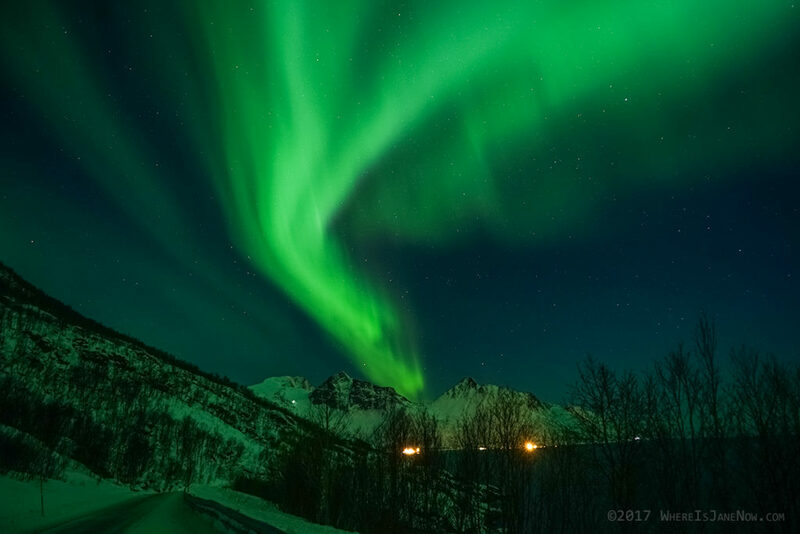 The night before this excursion, the shutter on my camera got stuck shut, and no amount of jiggling, pleading, or cursing could dislodge it, so my adventure actually began with a hour drive North to Tromsø to the mall to explore my camera options. There is a nice mall with free parking called the Jekta Storsenter, which has an electronics store called Elkjøp which happens to sell Sony Alpha cameras and also happened to have a good return policy. I purchased a new camera (ouch, but what else could I do, I was on this trip to do photography and that’s hard without a camera) and then drove over to Senja. Unexpected long day of driving, but the scenery is so nice, it hardly seems like a bother. 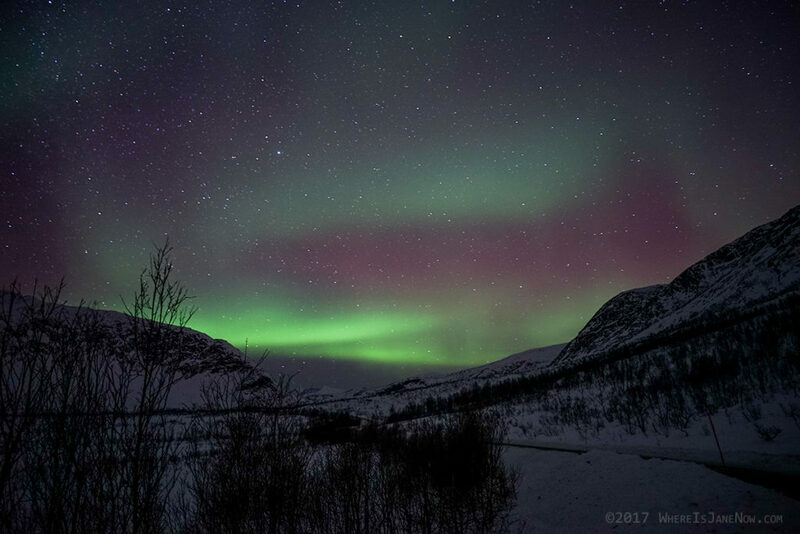 I went out in search of aurora that night, and enjoyed some nice active ones, and then was treated to my first purple/red aurora, which were faint but the camera picked them up well. I was not disappointed! 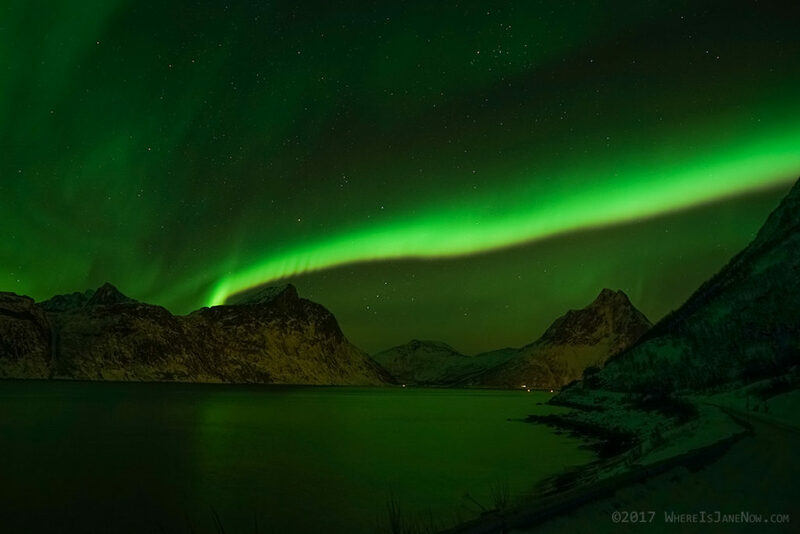 There was a grand variety of shapes that night, shimmering curtains of light, dancing this way and that… sometimes a river of light cascading across the sky overhead, from horizon to horizon… sometimes swirls and whirls over the mountains. 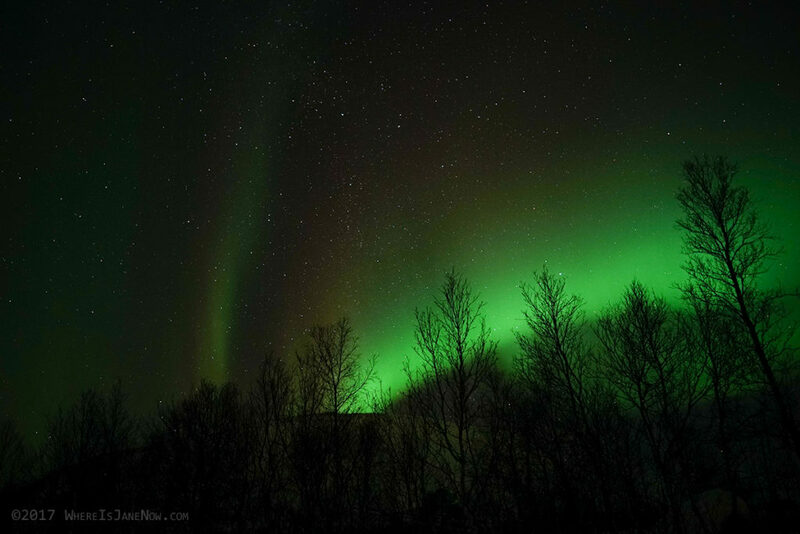 Dog sledding near Tromsø – two reviews! Your photos are stunning and fun at the same time, what a wonderful trip. 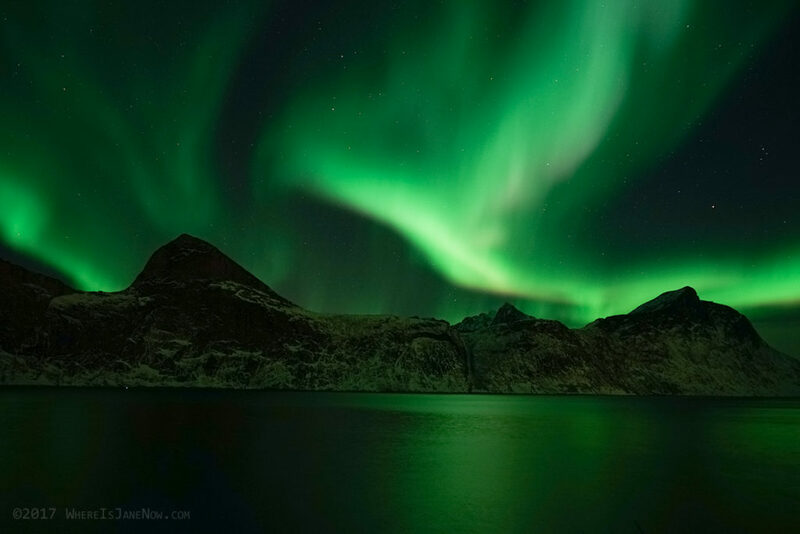 northern sky lights looks so amazing. Thanks for sharing this wonderful moment with us. Next story In the Pottery Studio!